The following interview with Jennifer Rampling was conducted by Stephen Weldon at the History of Science Society Meeting in San Francisco, California, on November 21, 2015. 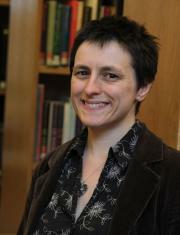 Rampling, Assistant Professor of History at Princeton University, won the first Neu-Whitrow Prize in 2013 for her compilation of the Catalogue of the Ripley Corpus. The Neu-Whitrow Prize is given every four years to a scholar who produces the best bibliographic or archival finding aid in the discipline, and is given by the Committee on Bibliography and Documentation of the IUHPST/DHST. For information on the 2017 prize, to be awarded at the 25th ICHST conference in Rio de Janeiro, see this link. In this interview, Weldon, the editor of the Isis Bibliography of the History of Science, sat down with Prof. Rampling to learn more about why she created this finding aid and why she thinks works like this are important for the future of scholarship. Stephen P. Weldon (SPW): What, in your view, is the most important contribution of the Catalogue of the Ripley Corpus [CRC]? writing in the 1470s in England, writing in both Latin and Middle English. His works became so popular that by the seventeenth century, a whole corpus of texts including poems and prose treatises had been attributed to him. But there seemed to be a lot of uncertainty about whether the historical Ripley actually wrote any or all of these, or whether they were simply pieces by anonymous authors which had been ascribed to Ripley for convenience or for some other reason. I originally started looking at these works just to help myself do the work. It eventually occurred to me that, since I was already trying to look at every manuscript that contained a text attributed to Ripley, it might save time to start cataloguing them as I went. So it started almost by accident. What really changed was when I decided to turn the catalogue into a separate, free-standing article, a bibliography, rather than just leaving it as an appendix to my Ph.D.
By the end of the seventeenth century there were about forty-five works attributed to Ripley, of which just a handful were likely to have been written by the historical alchemist. And as far as I could see, no other scholars working on alchemy had compiled this data or knew which works were genuine or not. So, I thought by publishing this as a bibliography, it would offer a starting point for other scholars interested in early modern alchemy, just to give them a handle on who wrote what, and roughly when, and just save everyone a great deal of time and effort. Moving beyond the history of alchemy, I hoped it would also provide a methodology for dealing with pseudonymous corpora more generally. Pseudepigraphy is very common in alchemy, where often texts are not written by the person whose name is on the title page. There isn’t really any consistent way of handling these huge, sprawling, messy bodies of works. I thought this would at least be a starting point; it might be useful for other bibliographers grappling with similar problems. SPW: What advice would you give to young scholars who are starting projects that require the creation of a research tool like this? JMR: I would really encourage anyone working with archives to think about doing something like this. First, it will help you in your own research, because the primary user of a bibliographical tool is likely to be you, the person who made it, since you’re designing it to help answer a specific question. I could not have finished my Ph. D dissertation, and I could not continue with my current project on English alchemy, without having a very clear sense of which works are likely to be authentic, and where all the manuscripts are and how they relate to one another – information which is all there in the CRC. So, you can help yourself immeasurably. Also, think about the kind of works you refer to when you are doing research. Of course we all have our favourite monographs and preferred articles, and so on. But, which works do we just use time and time again? The catalogues we reach for, the finding aids we look up online whenever need a starting point in the archive; that stuff can actually end up being more important to our research than works of synthetic scholarship. That’s one thing to think about. Being blunt, if you produce the tool, it also means that everybody who works from those sources in the future is going to cite you. If you are a student or an early career scholar, it’s easy to think that cataloguing and bibliography are tasks that you need to leave to venerable older scholars who have seen everything, but that’s not necessarily the case. If you are out there now doing your research, if you’re actually in the archive, you are incredibly very well placed to accumulate this kind of information, and to publish something that will be hugely appreciated and cited by other scholars. SPW: You know, one of the reasons I really like editing the Isis Bibliography is that I know most scholars in our field will consult it at some point, whereas a specialized article that I write will be read by only a small group of people interested in my particular topic. Finding aids of this sort are very different kinds of projects, and I think that they do have a longer life in many respects. JMR: Exactly. I like to think that producing a bibliographic work brings you into contact with different bodies of scholarship to the ones you’re used to. For instance, I learned a lot from historians of the book when compiling the catalogue, and I hope that the CRC can be useful for them in turn. It would also be great to reach scholars from other disciplines, such as literature, who might approach Ripley primarily as a poet rather than as a practicing alchemist, but who still want to know what he wrote, and where to read it. I should say one other thing. In the era of digital humanities, this kind of finding aid is becoming ever more important. We are now reaching a kind of information overload where there are so many manuscripts being digitized and placed online… Which is obviously a wonderful thing because it means that we can now do primary source research even if we perhaps don’t have travel funds to go abroad. We can also do comparative and collaborative scholarship much more easily – there can be hundreds of scholars around the world all looking at the same images at the same time, and bringing their skill and insight to bear on those sources. But this also raises new problems even as it solves others. For instance, how do you find the material in the first place? People who are able to catalogue, to hunt out, to present this kind of resource either in an online format or in print, are doing a huge service for the entire academic community. SPW: Even more important in digital age, not less. JMR: I think so. Not that I think the age of paper is over quite yet. SPW: I completely agree. Any last thoughts? JMR: I would just say that there is a bigger picture here. It is an unattainable dream, but one that might be worth striving towards even if we never actually get there. That is the idea that one day we will all be able to join the dots between archives, and map all their resources. We will just know everything that’s out there. We’ll be able to go quickly to exactly those sources which are going to be most useful and interesting for us as scholars. Imagine, within a few minutes, being able to see everything, every copy of a work by a particular author, or dealing with a particular topic, and every archive related to a scholarly project. As I say, that’s an unattainable dream, but the more finding aids we have, the closer we get, and without having to re-invent the wheel every time. Such finding aids are not replacements for analytical work, of course. They will never be the end of the project, but they may perhaps offer a very fruitful beginning. SPW: Indeed. Thank you so much, Jennifer. Many thanks to Tomoko Yoshida, who transcribed this interview.